As you may know I do not go to many away games, though shortly after the FA Cup fifth round draw I quickly decided that I wanted to go. Few days later train and match tickets were sorted. Nearing match-day and the recent poor weather had not relented and doubts whether the game would go ahead started to pop into my head, had a discussion on this at work with colleagues and I was convinced it would be on come 3pm Saturday. The day of the match finally arrived. South eastern trains had kindly decided not to run any train service on Saturday morning, I was already planning to get a lift in the morning to Charlton station so I made my way to North Greenwich tube station instead. Within half an hour or so I was at St Pancras where I collected my tickets and popped to a shop to grab a couple of items, as I’m leaving said shop I bumped in a fellow fan Daryl who proceeds to inform me that there is a pitch inspection…. We both head to a pub located in Kings Cross and over some breakfast and a drink or two talked about the recent form, the pitch and the threat of the game being called off. Social media was doing the same as usual by confusing the hell out of us and as more fans joined us for breakfast we were hoping our train would be delayed. The pitch inspection was taking place from 10:30, our train departing at 10:26. Of course we were not expecting the decision straight on the dot so we knew we had to get on our train and hope the game would be going ahead. Just after 30 minutes of being on our way I received a message confirming the worst, damn. Special mention here for the train company who announced even though we had booked our returning train journey they would allow us to go home when we desired, very much appreciated by us all. Everyone’s focus now turned to what shall we do now? 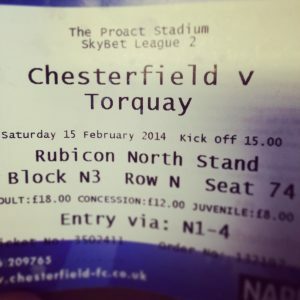 After some lengthy deliberation myself and others decided on disembarking at Chesterfield to go and see the League Two leaders play Torquay who are fighting against relegation. Sounds familiar I thought. 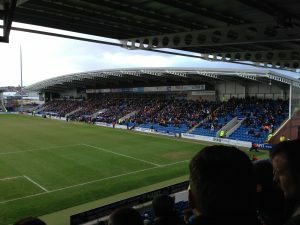 The train pulled into Chesterfield we got off and walked to the stadium, there was a brief period where we had no idea where we were going but once I opened my map on my smart phone we were on our way and about 20 minutes later we entered the business park where the stadium was located. As we made our way round to the north stand to purchase away fans tickets (we decided to support Torquay) we were all commenting on how nice the stadium looked from the outside. You could tell facilities would be good here for a League Two club and having a sneak at the pitch it looked very green. After purchasing our tickets at £18 each we proceeded to the Rose and Crown pub across the road where we were welcomed by Chesterfield fans, often got asked why we were there. As time went on more Charlton fans entered and before you knew it the pub was very busy, saying that though it’s not the biggest pub I’ve been in. Match time fast approaching and we made our way in. 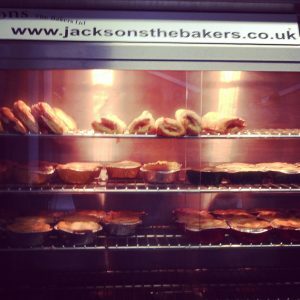 Food and drink facilities were very good, I had a Chicken and Mushroom pie accompanied by a beer. The guy serving me was again asking why we were there and the Torquay fans were very accommodating. It was not long until we realised we were also joined by Sheffield Wednesday fans and some from Derby, though not sure exactly why the Derby fans were there. I think they were on a stag weekend though cannot be 100% sure. The game kicked off and it was an ok first half, the wind playing it part as the stadium was open in all four corners, Torquay took the lead which surprised us including Torquay fans. 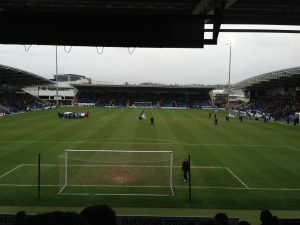 Not long after some sloppy defending let Chesterfield equalise. During the majority of the first half Charlton fans including myself were chanting, it was great fun to give the Torquay fans a boost and of course we slipped in a Charlton chant here and there. I was talking to Torquay fans either side of me about their plight, pitch and players. Half-time whistle blew and inside I went to get warmed up, the wind had taken it’s toll on me and the temperature was dropping. This called for a hot dog and hot chocolate, yes I had already had a pie I was feeling greedy. I stood there looking at the TV by the food kiosk and I realised Chesterfield had their own stadium TV service then it switched to Soccer Saturday. As the second half approached Charlton, Torquay, Derby and Sheffield Wednesday fans were taking it in turns to do a bit of chanting. I think the stewards were at first concerned by this but they soon realised it was just a bit of harmless fun. Everyone was there as a fan of football. Second half was not great football, I was starting to lose interest in the game truth to be told and was jumping around to try and keep myself warm. 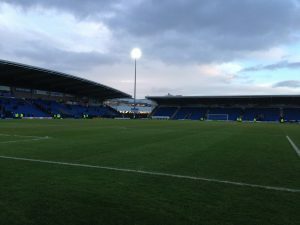 Chesterfield proceeded to score two more goals to finish 3-1 winners. Final whistle went and we made our way back to the station with a quick pit-stop for refreshments. Back in London we all said our goodbyes and each made their way home. Considering our match was postponed I had a positive day, we do really have some great fans. A mention has to go to our very own Dean Gaffney look-a-like, he did not live that down and took the constant joking at his expense very well. I owe you a beer! As I said at the start as I don’t go to many away games I’ve never had this happen to me before, still had a great day and would like to say thank you for Chesterfield making us feel welcome and the same to the Torquay fans in the away end. It’s something I would recommend doing if you are ever making your away to an game and it’s postponed.